As negotiations between Harvard and its dining workers continue without resolution, administrators are ratcheting up efforts to minimize campus disruption and calling for volunteers from the exempt employees within several of its schools to help out HUDS. Sandra Parada, a staff assistant for Harvard’s Campus Services responsible for coordinating volunteers, wrote in an email that Harvard is “actively seeking for volunteers all across campus,” adding that the University is only looking for exempt employees. Exempt employees, such as freshman proctors, are not paid hourly or eligible for overtime pay. “As we speak, I am receiving emails from colleagues offering to lend HUDS a hand,” Parada wrote. Faculty of Arts and Sciences Dean of Administration and Finance Leslie A. Kirwan sent an email to FAS department administrators requesting exempt staff to aid dining hall managers as the strike continues. 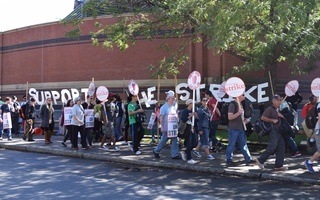 Harvard’s dining workers have reported to the picket lines each day since Wednesday, going on strike in response to a nearly fourth month-long bargaining process with the University that has thus far failed to produce a contract agreement. The latest bargaining session between HUDS and the University on Saturday did not yield an agreement, and the two parties will meet again for their 22nd session Monday morning, according to Harvard spokesperson Tania deLuzuriaga. 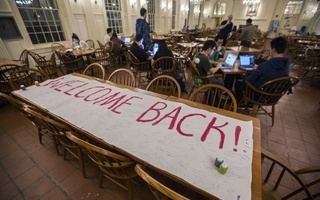 As the picketing continues, six of the 13 undergraduate dining halls closed for the weekend, and Harvard has enlisted a small cohort of temporary workers to staff those that remain open. Before the workers went on strike Wednesday, the University began stockpiling frozen food. 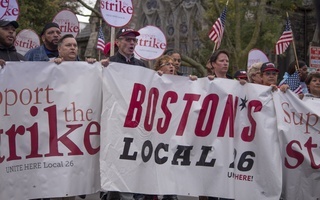 Harvard’s dining workers are receiving roughly $40 a day in compensation from their union— the Boston-based UNITE HERE Local 26—for the duration of the strike, Local 26 president Brian Lang told the Boston Globe. Representatives from Harvard and Local 26 have disagreed about health benefits and wages over the course of negotiations. 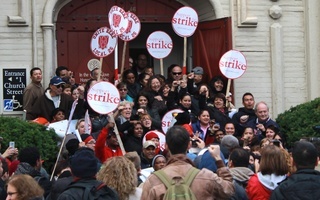 Local 26, often using Harvard’s $35.7 billion endowment as a rallying cry, has called for the University to provide year-round work for interested employees and institute a “minimum guaranteed salary” of $35,000 for those workers, according to Local 26 spokesperson Tiffany Ten Eyck. HUDS workers are laid off during the University’s recesses and are not able to draw unemployment because of the school’s status as a non-profit organization. In response, the University offered workers a series of summer stipends between $150 and $250 dollars, which would be paid out weekly “even if there are no open shifts,” according to deLuzuriaga. Harvard also proposed its dining workers enroll in the health benefits package that its largest union negotiated last winter. That plan would eliminate deductibles, increase copayments, and establish a new premium contribution tier for workers who make $55,000 or less annually, in which Harvard would contribute 87 percent of the premium of the lowest-cost plan. The plan would also fund a “flexible savings account” of $80 per year in 2018 and 2019, and $40 in 2020. Flexible savings accounts allow employees to pay “predictable” health expenses related to caring for a dependent with pre-tax dollars, thus lowering a worker's taxable income. Harvard also extended a second option to the workers, in which the University would contribute the “equivalent cost of the Harvard University Group Health Enrollment premium” to a health insurance plan offered by Local 26. About 300 HUDS employees are currently enrolled in that plan. A crowd of Medical School students rallied Monday in support of the University’s dining services workers, who are threatening to strike.